Play video Our cameras will be close to the action all day, hopefully not TOO close!Our cameras will be close to the action all day, hopefully not TOO close! Play video Our cameras will be close to the action all day, hopefully not TOO close! Play video FA People's Cup tips...from the England boss!FA People's Cup tips...from the England boss! Play video FA People's Cup tips...from the England boss! There have been a whole load of brilliant matches today and eight very worthy winners. Everyone who has competed today has done themselves proud. They were all part of the final 96 out of the massive 6,000 teams that entered. We'll be right back here tomorrow for more of the same from 11:30 BST. 48 teams in eight more categories battling it out in the nation's biggest five-a-side competition. At the end of an excellent day, let's take a look back at today's winners. It may have been the last final of the day, but there wasn't any sign of tiredness from the players in this match. The Filthy Fellas took on Pathetico and you can watch the highlights now! The FA People's Cup wouldn't be possible without the help of amazing volunteers. Just like this wonderful group from a local club who have volunteered their time to help out at the finals today. Referee Rob Parker tells us what it's like switching from playing to refereeing. I get the impression he'd rather be kicking balls than blowing his whistle! Congrats to Aston Villa indeed. They were brilliant all day and very worthy winners. It was all even between the Wockey FC girls and Nottingham Medics in the final of the Higher Education Female category. So, for the second time today we witnessed a penalty shoot out. Mr Sinclair himself was impressed with the play in the Walking Football category earlier. Tempted to join in, Trev?! Wokingham walk through to the final! Wokingham needed a penalty shoot-out to even reach the Walking Football final before beating Leeds Titans in the final. Watch that dramatic moment below. Wokingham won through in one of the most fiercely contested finals of the day, in a Walking Football final that saw the day's only sin bin and plenty of passion. And they certainly celebrated with passion afterwards as well. Well-deserved mind. Liberties Vets and Harraby took centre stage on the finals pitch for the final of the Male Vets category. After a tight match, the Liberties defended their 2016 title and will join the other champions on the trip to Wembley. A day to remember for the Kingston queens! Kingston were the first winners of the day, beating Elita 5's in the Under-14 Girls final. So earlier on this afternoonWokingham UB50 took on Leeds Titans in the final of the Walking Football category. With a trip to Wembley up for grabs, it's all got very competitive. Watch out for the ref reaching for his pocket to pull out a... blue card!? (We've checked the official rules, and this means a 2-minute time-out). Wokingham came from behind to win it. Watch all of the goals in the video above. Well that's it! All eight of today's finals have been completed. Don't go anywhere though. We have got the highlights from the last four finals of the day coming right up. Also on the Filthy Fellas roster was a gent called Abdi, who was sporting an Arsenal shirt. He's never seen his club live. Now he'll have tickets to see them in the FA Cup final at Wembley. Filthy Fellas are led to victory by a goal and an assist by a man who has the audacity to call himself Messi. Messi, Filthy - they'll have to brush up smart in May because they'll be taking a trip to Wembley in May. What a tasty little finish this is! Messi with the assist, then another Filthy Fella - who isn't conveniently wearing a football shirt for me to dub him with a nickname - dribbles past his man and scores. Is that the final act? Did I dare to question the powers of Messi? You can't keep players like that quiet for long. He beats his man and slots Thierry Henry-like across the goal. It seems like Messi is actually being called Messi by his teammates... Anyway, Messi's touch lets him down in front of goal. Not often you can type that. It's all Filthy Fellas now though, and the Pathetico 'keeper is forced to tip brilliantly onto his bar. Watch a compilation of the best goals from day two of the FA People's Cup finals in Birmingham. Watch highlights of the Adult Female category at the FA People's Cup where Plymouth Norton beat Stockton Ancients 3-2. Armley LC Female Vets put up a good fight, but the ladies from Hackney won 2-0 in the final of the Female Veteran category. Exeter City are the winners of the Disability Premiership category after a great battle against Tynside Ability DFC. Watch this brilliant individual goal for Plymouth Argyle in the U16s final at the FA People's Cup. A narrow win from Portland after a 3-3 draw with Mill Hill took them to penalties. Watch the highlights. Watch match highlights of Under-16 girls final in Birmingham as Sprowston Girls beat Plymouth Argyle 4-1 to win the trophy. Watch highlights as Wockey win the Female Higher Education category of the FA People's Cup finals in Birmingham. Watch a compilation of the best goals from day one of the FA People's Cup finals in Birmingham. Watch highlights as Filthy Fellas fight back to beat Pathetico 3-1 in the Male Higher Education category of the FA People's Cup. Watch match highlights of Female Disability final in Birmingham as Aston Villa beat Aylestone 4-0 to win the trophy. Watch match highlights of Under-14 Girls final in Birmingham as Kingston Select beat Elita 5s 4-2 to win the trophy. Watch match highlights of Youth Disability final in Birmingham as Cedarsfield beat Bromley Green Valiants 6-1 to win the trophy. Abdi, from the Higher Education Males category, reacts to seeing a huge picture of himself on the wall at the FA People's Cup finals in Birmingham. Watch match highlights of Under-14 Boys final in Birmingham as Sproatley Juniors FC recover to beat Rovers FC to win the trophy. LBoro Rangers are a group of university friends who play rugby together and made it through to the FA People's Cup finals. A fantastic regional semi-final round of the FA People's Cup draws to a close, with a Wembley trophy lift one step closer. Watch a nutmeg, dribble, finish and celebration like Cristiano Ronaldo during the semi-finals stages of the FA People's Cup. All the action from the FA People's Cup semi-finals as it happened. Relive all the action from the FA People's Cup semi-finals with the best of social media and live text commentary. Manager Gareth Southgate led England to their first World Cup semi-finals in 28 years. 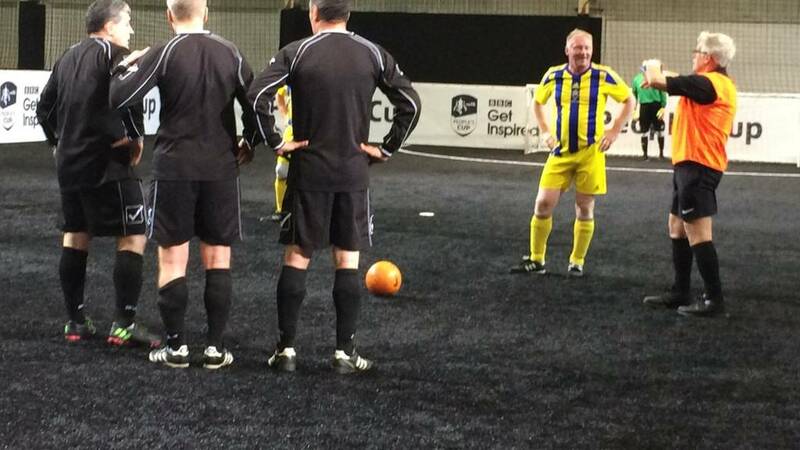 We caught up with him before the tournament to find out his top tips for (five-a-side) cup success. How on earth did he score from there? Watch a stunning solo goal from one of the men playing in the Adult Males category of the 2017 FA People's Cup first round. Watch what it's like to play in the FA People's Cup with our special player-cam footage from Shoreditch in east London. In a move reminiscent of Leicester City and Claudio Ranieri, FA People's Cup side Boys from Nancy 'sack' their manager. Registration is now closed for the 2019 FA People's Cup - but find out how to follow the nation's biggest five-a-side tournament.